BioHorizons supports hundreds of high quality educational programs each year. Topics include dental implants, biologics, instruments, surgical techniques, prosthetics, practice building, digital dentistry, treatment planning, risk management, and new technology and more. Search for an international course or local event in your area using the tools below or go directly to the education calendar in your market. BioHorizons dental implants are clinically proven through some of the most thorough and in-depth research in the industry. We offer nine comprehensive implant lines, covering virtually every surgical and prosthetic indication or clinician preference. Our dental implants have a 99.2% average implant success rate1-10 and also come with a lifetime warranty giving you peace of mind. Our broad range of Prosthetics cover a wide range of indications and patient conditions and feature some of the tightest machine tolerances in the dental industry. Our unique conical connection creates a biologic seal eliminating the microgap seen with other systems. 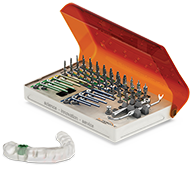 Through advanced Spiralock® technology, abutment screws remain tight over time. This presentation will cover detailed concepts of diagnosis and treatment planning using state-of-the-art 3-D imaging modalities for the purpose of customizing therapy based on individual implant receptor sites. This presentation utilizes results from a prospective clinical trial as well as clinical experience to outline indications for effective and efficient utilization of narrow diameter implants in regions of limited space.